What steps do you take to begin healing? What mantras are good for healing? What's the difference between positive affirmations and denial? How can you remove the cause of negative effects using mantra and visualization? What's the definition of evil? Mrs. Prophet, your explanation of the violet flame sounds complex. Can you simplify it? The violet flame is really a very simple gift of the Holy Spirit. 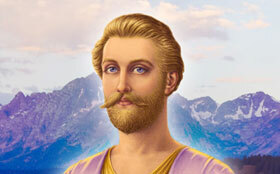 But Saint Germain is the Master Alchemist, and he is the scientist of the age of science. Most inventions, when they are applied, of course, are simple for the everyday man to use. It isn't necessary that we know all of the technical workings of the violet flame to use it every day. I like the simple mantra to the violet flame I AM a being of violet fire! I AM the purity God desires! When you repeat this mantra with great sincerity in the depths of your heart after a period of meditation, you can draw all the energies of your communion with God through prayer and meditation into focus in your heart for the wholeness and the integration of your four lower bodies. When we say, “I AM a being of violet fire! 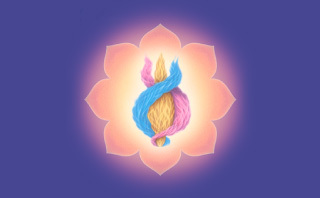 I AM the purity God desires!” we see the entire body filled with the violet light—crackling, sparkling, leaping violet flame passing through and consuming that substance that is impure. This is the beginning of healing, but there are many steps to healing. I think it is important to establish meditation upon one's inner blueprint, upon the soul and its pattern. I call this the science of the immaculate concept. It really is the sacred science of the Mother. A certain understanding of this science has filtered through the metaphysical movements of the past century. The science of the immaculate concept is based on the realization that God has made man in his image and likeness, and therefore behind the outer manifestation there is a perfect reality and a perfect form. We must have clearly in mind that the natural state of being is wholeness, is oneness with God, is the perfection of the Law. This perfection, this law, this being, is the True Self that exists behind the outer manifestation of an absence of wholeness. In reality, this is the Real Self that we would become. We can visualize the All-Seeing Eye of God superimposed over our third-eye chakra. Using the gift of God of clear seeing, we behold the perfect Master. We see before us Jesus the Christ. 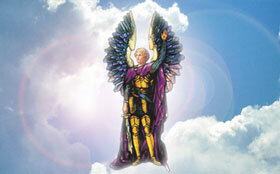 We have his image clearly in mind, as he is a key figure in our overcoming. Or we may visualize the Buddha or Kuan Yin or Mother Mary. We translate the perfection of these sons and daughters of God to our own self, and in the calmness of our meditation upon God we know that this identity is also native to us. Then we begin to mentally affirm that perfection, even as we verbalize that perfection through the Science of the Spoken Word. You know, Jesus used a number of mantras in his ministry, but these are taken as simple expressions about himself. He used the word I AM to declare, “I AM the way, the truth and the life.” Not understanding the use of “I AM” as the name of God, people have thought that he was referring only to the man Jesus. But he was referring to the fact that the God in Jesus is, was and ever shall be the way, the truth and the life. The consequence of that affirmation must be wholeness. If we enter into it as a meditation and really understand it as a mathematical formula, it becomes an equation of being. If God is where I am, if he in truth is congruent with myself here and now, if God is the way, the truth and the life within me, then I too must be that reflection and the fullness of that glory. I too must be whole. This is a natural process of healing that we follow as alchemists of the sacred fire, as we would also become scientists with the great scientist Jesus Christ. What about simply affirming one isn't sick? That gets into denial. It's all right to deny, but you must follow it up by filling your body temple with light. 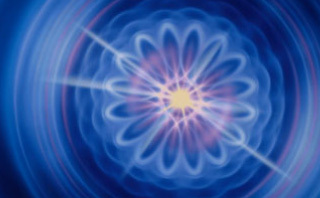 You see, energy can neither be created nor destroyed. When you merely deny that you are sick, you are practicing a form of autohypnosis. You are hypnotizing the self into believing you are not sick, but you are not doing anything with the energy. This energy must be dealt with; it is going to go somewhere. If it is manifesting as disease in the physical body and you deny its presence, it may very well manifest in the feeling body or the mental body or be driven deep into the subconscious. The ascended masters have told us that if we merely deny disease, we use our free will to alter the working out of karma. Karma is simply the law of cause and effect. All disease is an effect of a prior cause, and usually that cause is some form of mental or emotional discord. That discord eventually works itself out on the physical level and then we are purged of it at every other level. The cycles of the flow of energy in the four lower bodies always move from the memory (or etheric) body, where everything is recorded at the subconscious level, through the mental body, through the feeling body; and finally the ultimate effects will be in the physical body. Old age, disease, disintegration, decay are all the result of prior causes recorded in the etheric body that have cycled through the mental and emotional bodies. Denying disease, then, can be a form of what I call mental physics. It is using the mind to rearrange matter but it is not getting at the cause behind the effect. The only energy that can erase those effects is the energy of the Holy Spirit. The Holy Spirit is absolutely essential to our healing and to our wholeness. The specific energy of the Holy Spirit that is required is the violet flame, the light of forgiveness. This is why Jesus said, “Thy sins be forgiven thee.” He was invoking by the Science of the Spoken Word this energy of the Holy Spirit. We need to be careful that we remove the cause so that we can be forever free from the effects. The ascended masters have taught us that if we, so to speak, shove all effects in our outer world back into the subconscious by simply walking around denying that things exist, we are simply postponing the day of reckoning and in a future incarnation we will have to deal with those subconscious patterns. However, in the true sense of the word, the action of denying evil has an important part in our demonstration of the science of the Mother. It comes from Jesus' teaching “This kind goeth not out but by prayer and fasting.” Prayer and fasting represent the yang and the yin, or the Father and the Mother, the Alpha-and-Omega balance of the science of wholeness. So prayer and fasting are like affirmation and denial. We affirm truth, and by the power of that affirmation we can deny the opposite. 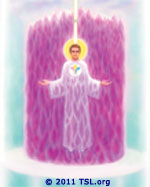 For instance, we can say, “I AM whole and I AM the manifestation of God.” Then we can deny the opposite: “And there is no disease, there is no incompleteness, there is no absence of the fullness of God's being in me!” That denial, when it goes along with the affirmation and is accompanied by the use of the violet flame, represents a more complete formula for healing. Is instantaneous healing possible? Does it happen often? It certainly is possible. It comes by belief, it comes by the gift of the Holy Spirit. But often the instantaneous healing is a manifestation of the mastery of the healer rather than the one healed. For instance, Lazarus was raised from the dead by Jesus. This was a demonstration of Jesus' mastery over death. Lazarus himself subsequently died; he had not mastered the energies of life over death. Subsequent to his death, he reincarnated and has continued to reincarnate and has yet to prove the law of the ascension. So it's up to the individual to heal himself in the ultimate sense?